Pentax has unveiled a new high performance compact camera with an array of premium features including full manual, semi-automatic and automatic shooting modes. The Pentax MX-1's four times optical zoom lens features maximum aperture of f/1.8 to f/2.5 and starts at a wide angle of 28mm (in 35mm format). The camera also features a 1cm macro mode for shooting images close-up. An intelligent zoom function is available to extend the zoom coverage up to approximately 7.8 times - boosting it up to around 218mm (in 35mm format). A newly designed back-illuminated 12 million pixel CMOS sensor can be found onboard. A top sensitivity of ISO 12800 is available, with the company promising low noise and super high resolution images. The Pentax MX-1 features a new imaging engine to offer quick image processing performance for clear, high quality images with plenty of detail. A unique Handheld Night snap mode helps you capture blur-free night-time images by taking multiple shots in a burst and compositing them together in one photo. A tiltable 3-inch LCD monitor can be found on the back of the camera. It also displays views of menus for making quick changes. The design of the camera is reminiscent of film cameras, and includes a textured-rubber grip and brass top and bottom panels. A pop-up auto flash and a number of metallic parts, such as a metallic lens ring, are also designed to give a premium appearance. 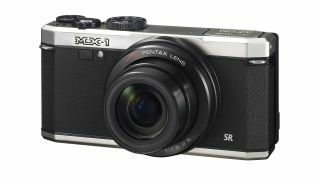 Other interesting features of the Pentax MX-1 includes its ability to capture in raw DNG format, a dual-shake reduction system to help prevent blur in images and Full HD video recording. Available from February, the Pentax MX-1 price will be £399 in the UK (around AU$612) and US$499.95 in the US, putting it at the other end of the scale from the brand's recent budget camera, the Pentax Optio RZ18.